This specialised safari is perfect for those with a sense of adventure. We will start off in Victoria Falls which is Zimbabwe’s main tourist attraction. Then we will spend a few days on a camping/lodge combination in Hwange National Park – one of Africa’s forgotten game parks. What makes this a special safari is that we will spend a couple of nights camping at some of the best waterholes in Hwange. For this reason we have to book well in advance. 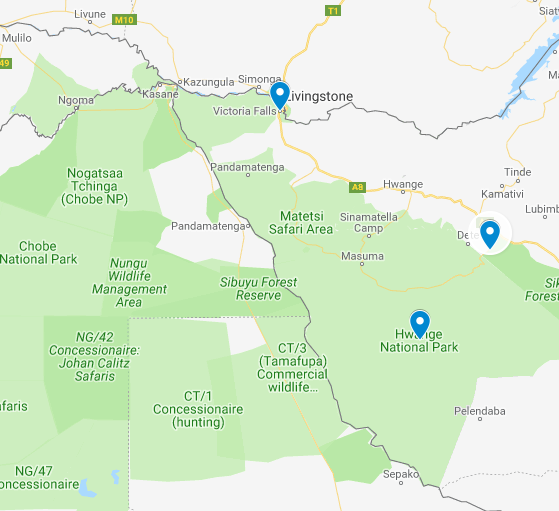 From here we either return to Victoria Falls or do an extension to Mana Pools National Park, Lake Kariba or an additional night in Victoria Falls. After meeting you at the airport you will be transferred to the lodge or hotel in Victoria Falls for lunch and to freshen up. After an hour or two to relax and enjoy the view over the Zambezi River or nearby waterhole, we will visit the famous Victoria Falls. On our return we will do an afternoon boat cruise on the Zambezi River. What better way to welcome you to Zimbabwe than with a sunset over the mighty Zambezi. An additional bonus is that we will be the only people camping at the sites every night. Hwange is famous for the big number of elephants and buffalo that are often found at the waterholes. Other game often seen drinking here are Giraffe, Zebra, Blue Wildebeest, Kudu, Impala, Warthog, Sable, Roan, Waterbuck and Eland. Predators like Lion, Wild Dog, Leopard, Cheetah and Hyena often drink during the night or early in the morning which gives a great opportunity to see them before other tourists arrive from the main camps. After 4 nights in the bush we will spend our final night in Hwange at Hwange Safari Lodge just outside the park. The lodge has a beautiful setting overlooking a very popular waterhole which is frequented by Elephant, Lion, Wild Dog, Zebra, Sable, Kudu, Buffalo, Warthog and Impala. What better way to say goodbye to Hwange that to sit with sun-downer drink enjoying the scenery in front of you and a final farewell dinner. After 4 nights in tents everyone will enjoy sleeping in a bed. After a leisurely breakfast we will make our way back to Victoria Falls for your flight home or continue our safari with one of the possible extensions or off to another Southern African destination. Why not continue the safari with an additional 4 nights on a camping safari in Mana Pools? Mana is one of the best game viewing destinations in Africa with its beautiful setting in the Zambezi valley and is known for Elephant, Buffalo, Hippo and Lion sightings. All the general game is present in great numbers. Why not spend a couple of nights on a houseboat on Lake Kariba. Besides game viewing you can also try your hand in trying to catch the legendary tiger fish of the Zambezi. It’s a great way to unwind and relax after a week in the bush. Victoria Falls is the perfect destination from where to start or finish a safari.